Coaches for the River Socks and home run derby champ Tate Queen (not pictured Norm Brooks). As local travel baseball wears down this summer, the Scioto River Socks added to the list of area organizations that were able to compete and win on some of the highest stages in youth baseball and softball. 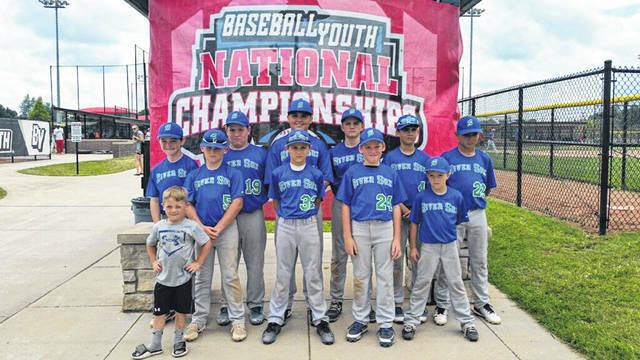 The River Socks traveled to Elizabethtown, Kentucky to compete in the Youth Baseball Nationals, in which they finished third out of twelve teams from all over the country. Queen is assisted by coaches Norm Brooks, who Queen considers to be his co-head coach, James Leeth, and Jeremy Ridout. The River Socks competition comes from all over the state of Ohio, mainly from playing in tournaments in larger cities including Cincinnati and Columbus. These tournaments are organized by the United States Specialty Sports Association (USSSA) and are held in larger cities to attract area teams to showcase local youth baseball talent. 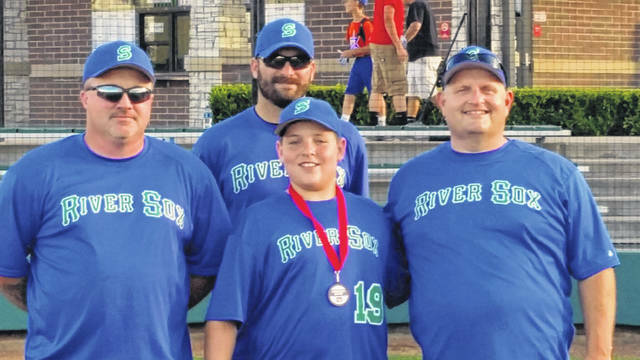 This year’s River Socks team won three tournaments before heading to the Youth Baseball Nationals in Elizabethtown. Although that is two less tournaments that the same group of boys won last year, Coach Queen was not concerned with that because the level of competition was that much higher for his group of boys this year. Queen’s son, Tate, won the home run derby at the Baseball Youth Nationals tournament. A representative from each of the twelve team participated in the event. Tate hit eleven home runs in the first round, good enough tied for second, meaning he would need to go into a playoff with another player to determine who would reach the finals of the event. Tate won the playoff, and consequently won the final over a player from Chesterfield, Missouri by hitting twelve home runs compared to the nine from the opposing player.